Playa den Bossa was designed with the modern tourist in mind and has become one of the busiest and best-loved resorts on the island. It has almost universal appeal, offering up Ushuaia and Bora Bora to those out to party, a huge sandy beach and the excellent selection of watersports and local activities for holidaymakers who don’t like to sit still. 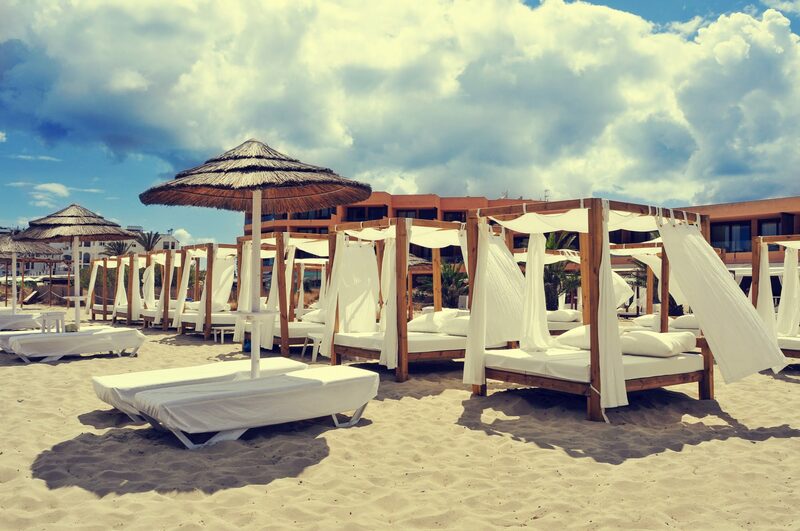 Basically, between the beach and the nightlife, Playa den Bossa has something to offer just about everyone, no matter what kind of Ibiza holiday you’re looking for. The spectacular beach at Playa den Bossa is undoubtedly one of the resort’s biggest selling points. Long and sandy (the longest in Ibiza), it stretches along the southern coastline mid-way between Ibiza Town and the airport, the miles of soft, golden sand providing plenty of sunbathing and messing about space for the holidaymakers who flock in droves each year. With the beach as such a focal point, by day many of the activities available at the resort are beach-based. There’s a massive selection of sun loungers and parasols if you like to spend your time horizontal with a book and a beer, or a huge range of sports like boating, jet skiing, pedaloes, kite surfing, volleyball and catamaran rental, if you don’t. There’s also a dive school and windsurfing school if your practical skills need a little polishing and a water park nearby if the waves of the Mediterranean aren’t providing enough thrills. The beach is lined with bars and restaurants, from the infamous Bora Bora beach bar that sits roughly in the middle of the length of the beach, to the small local restaurants serving up excellent, freshly caught fish. The further away from the Ibiza Town side you venture, the quieter the beach becomes so revellers looking for somewhere to sleep off an aching head should head up towards the watch tower. The resort is particularly good for families as there are plenty of child-friendly activities and the beach is shallow and perfect for paddling with little ones, particularly as it is lifeguard supervised. There are also several small amusement parks to keep the kids entertained, offering trampolines, mini-golf, ten-pin bowling, bouncy castles and climbing areas. Read more about Playa den Bossa Beach by visiting our Ibiza Beaches section. Playa D’En Bossa is about more than just its golden sands and there is plenty to do off the beach as well. With shops selling beachwear sportswear and fashion labels, you can shop until you drop before taking a break for a latte or an ice cold beer in one of the resort’s many cafes. Restaurants scatter the beachfront and the streets behind and cater for mass appeal, including good old British pub grub, the odd Chinese, Tex-Mex and pizza. You may not find yourself sitting down to a plate of haute cuisine in the resort’s restaurants but you won’t be paying through the nose for it either. If you’re looking for the kind of fun that gets going after the sun goes down, Playa d’en Bossa has that covered too. There’s every kind of drinking establishment you could possibly hope for, from Irish pubs, to the kind of hipster hangouts that have made the resort popular with celebs. The resort is cheaper than Ibiza Town and of course there’s plenty of Happy Hour bargains to be had, as well as live music and pubs and bars with big screens showing sports. The resort also has a whole new form of entertainment in the ‘lounge beach clubs’ where you can chill out during the daytime and join in the laid back party atmosphere after dark. In terms of clubbing, Playa D’En Bossa is looking to challenge San Antonio Town as the party capital of the island and with Ushuaia, Bora Bora and a rash of discos throughout the resort. Ibiza Town is an easy ten-minute cab ride for Pacha and all the major clubs are reachable on a short bus journey. Hotel accommodation in Playa D’en Bossa is plentiful and varied (see all our hotels in Playa D’En Bossa) and the popularity of the resort means you will be spoilt for choice whatever you’re looking for. While Playa den Bossa does offer everything a tourist could possibly need, it does suffer from this wide-spread appeal and if you’re looking for a peaceful break from humanity this is not the resort for you. The area is crowded, which can make for long queues and expensive amenities. The other thing to bear in mind is that Playa D’En Bossa is located right under the flight path for the island’s airport, which makes it convenient to get to, but make for a rather noisy atmosphere if what you’re looking for is total peace and quiet. However, if the hustle, bustle and excitement of a major resort is what you’re looking for, with all the activities and opportunities that comes with it, then Playa D’en Bossa is the destination for you.